Boring companies are being offered at fair value, but they offer potential without the crazy risks that come with hot darling stocks that everyone is chasing. Downside is that growth of these companies are limited or slowing. Fundamentals are strong for these boring companies and they are positioned well to help a portfolio. Seems like the well-known names and cannabis stocks are getting all the attention. Here are 3 that caught my eye and the criteria I’m using to find them. While papers and overblown fears like the FB data saga provided some opportunities for me to buy more, I haven’t come across a whole lot of actionable investments from the papers. Cannabis looks to be the new crypto and seeing how it’s not an area I want to be speculating in, my only option is to use the “old and outdated” method of searching for stocks with good fundamentals. Here’s what I’m looking for. Nothing fancy. High Piotroski score: I use this as a filter to eliminate fundamentally weak and speculative companies. I’m not interested in investing in early stage, money bleeding and operationally weak companies. Cash Return on Invested Capital (CROIC): A cash version of ROIC to determine whether the business is being well run. FCF/Sales: This signals cash generation ability and efficiency. FCF/Sales has to be positive. P/FCF: instead of using P/E, I want to see companies that are priced decently based on FCF. EV/EBIT: Lower means cheaper, but not necessarily better. I’m looking for companies where EV/EBIT is not at absurd levels. Sales Change%: looking for companies that are growing revenues. Profitability is important, but I also want to see that companies are growing and not stagnating. GPA – Gross Profit to Assets: Measures the growth of profitability. Answers the question, are the assets profitable? A GPA of 0.5 means the company is generating profits of $0.50 for every dollar of assets. The higher the ratio, the more profit is being extracted off every dollar of assets. This ratio is a great way to quickly compare competitors within the same industry. The first one on the list is Brady Corp. A boring company that sells products like tape, labels, thermal printers, safety signs, locks, software to help customers increase safety, security and productivity. The last time I witnessed wall street getting excited over yellow caution signs was… never. But since 2015, it’s performed admirably. This type of business isn’t going to grow fast. Majority of the sales are established and will likely grow at the speed of the economy. Top line has barely budged. 2018 annual revenues is pretty much the same as 2013 at $1.17B. The value they bring however, is the ability to expand margins, turn up profitability and improving efficiency. You know what to expect with these guys. They won’t blow you out of your shoes with their tech. But it’s something that is needed throughout fulfillment centers, warehouses, offices and so on. As the economy continues to chug along and businesses are created, Brady is a destination for such supplies. 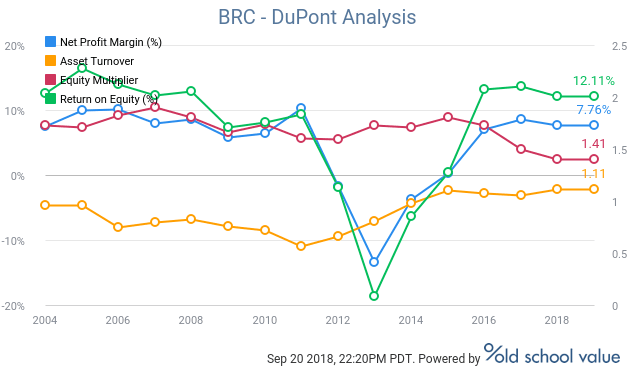 If you drill down into ROE using the DuPont analysis, you can see what I mean. ROE is currently at 12.1% where the main driver has been due to decreasing leverage and a slight uptick in asset turnover. 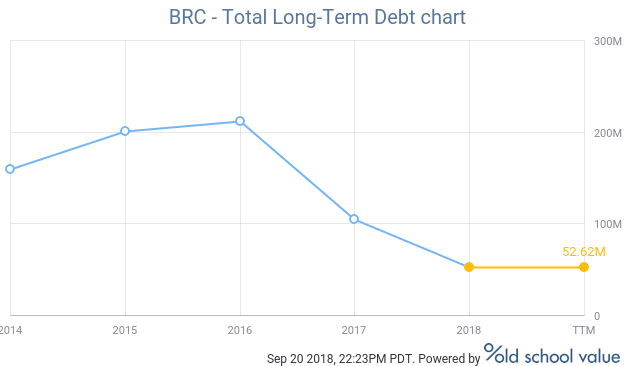 Brady does not have any short term debt and their long term debt has been drastically reduced. Even if the economy froze over, Brady has a strong balance sheet to keep it afloat. On the valuation side, things look fairly valued. 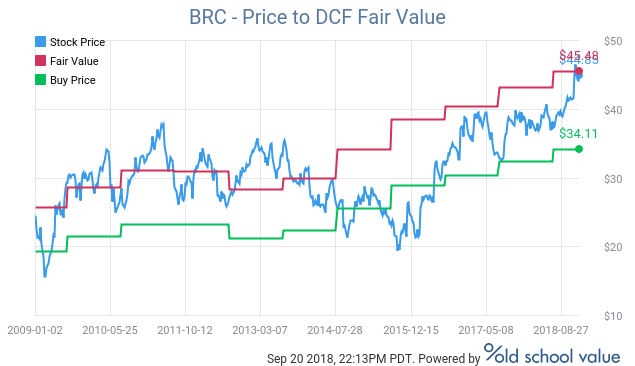 Using different valuation models to get different viewpoints so as not to anchor on one particular method or number, Brady looks to be valued in the $40 to $50 range. Brady Corp gets a solid B.
RHI provides staffing and risk consulting services. 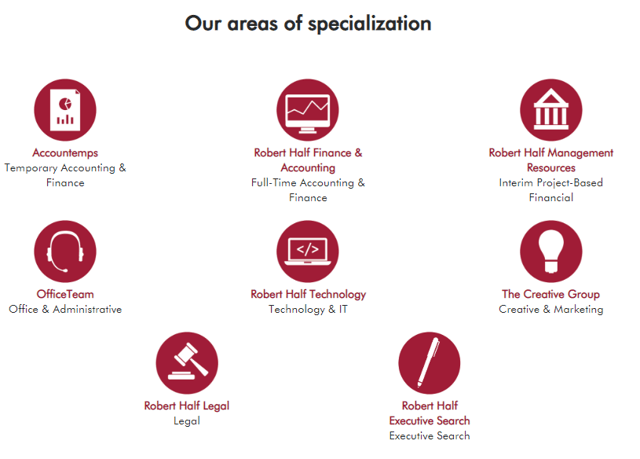 Robert Half specializes in the staffing the following areas according to their website. Risk consulting is where Robert Half consultants will review regulatory compliance requirements, give advice, report risks to management, develop a risk strategy and help companies stay compliant. E.g. Companies that need help and advice with IFRS accounting and tax rules may hire a consultant to help things get lined up and compliant. You know a company like Robert Half is below the radar when the last article on Seeking Alpha is from Dec 2017. Like Brady, Robert Half is another economy play. As businesses continue to grow, they need additional workforce. The cost of hiring a person isn’t cheap and services from staffing companies makes life easier for companies, rather than deal with the hassles that come with recruiting. We’ve hit the 10 year mark on this bull market and with business conditions continuing to improve, Robert Half has expanded margins, brought in more tech to streamline operations, which leads to efficiency and back to margin expansion. 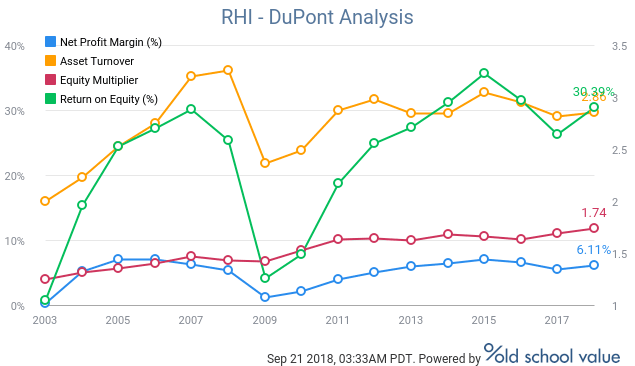 Here’s a chart of the DuPont analysis again that shows how Robert Half has been achieving growth and ROI. Margin growth directly correlates with the steady improvement since the 2008 crash. The 3 step DuPont analysis shows that increasing net margins and debt has helped them grow. But if you take the DuPont analysis one step further and dig into how payment on debt affects net profit margin, we see this. What this table shows is that of all the components that make up ROE, Robert Half’s main contributor to ROE is the margins. If their margins are good, ROE is good. If margins decline, so too does ROE. 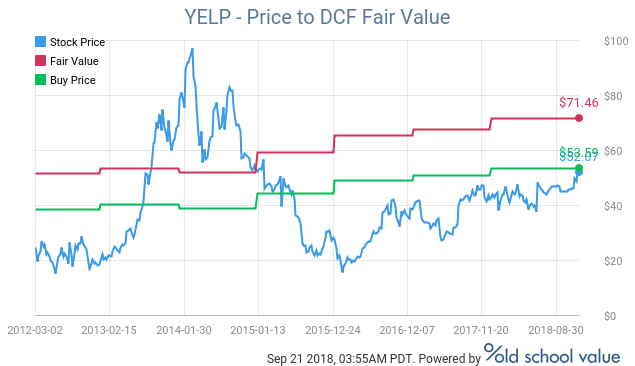 Take a quick look at valuation and the fair value range looks to be somewhere around $60 to $80. With the stock price at $70, it’s in the middle of the range. The big decision with Robert Half is whether you believe the economy will continue to grow. You can check the data for yourself. During any trip, there are 2 apps that I use to navigate my way around in new cities. Internationally, I’d replace Yelp with Tripadvisor, but that’s another article on its own. Yelp has pretty much become the go-to app to get recommendations for restaurants, services and other businesses. Yelp’s pay to play model shows their business model works. Their growth isn’t as fast as it once was, and Yelp is no longer a darling. Click to enlarge the image and you can see that revenue growth YoY is slowing down. Yelp is not dying, but the company has to continue coming up with new ways of monetizing their website. YTD, they have been showing they can turn on the profit with net income being positive for only the second time in their public history. The advertising focus is back with businesses showing they are willing to pay for real estate on their website to drive traffic to their business. If Yelp can continue taking cues from Amazon’s Advertising arm, they will see the extent to which Amazon sellers are willing to pay to drive traffic and clicks to their listings. Continue applying this updated advertising focus and Yelp’s FCF will start to flow heavily. Yelp is simply a review platform. The more users they get, the more businesses will enlist and pay for ads, and the more users it will bring. If Yelp continues to find new ways to acquire new users, it will pay off in the long run, just like what Amazon did, and still continues to do. Brady Corp (BRC), Robert Half (RHI) and Yelp (YELP) show up in the list when searching for companies with good Quality, Value and Growth aspects. Disclosure: No positions in any stocks mentioned.